Pigsty, a new neighbourhood restaurant and bar on Bristol’s Gloucester Road, has opened for business, with all interior design and graphics on the scheme created by Bristol-based hospitality and retail specialist Phoenix Wharf. The 100-cover space, aimed at families, couples and group diners, offers high-quality dishes based around good quality, local produce and the company’s own pork products from the Jolly Hog. Pigsty also includes a bar with a takeaway area, offering cooked and fresh sausages and bacon to take home. 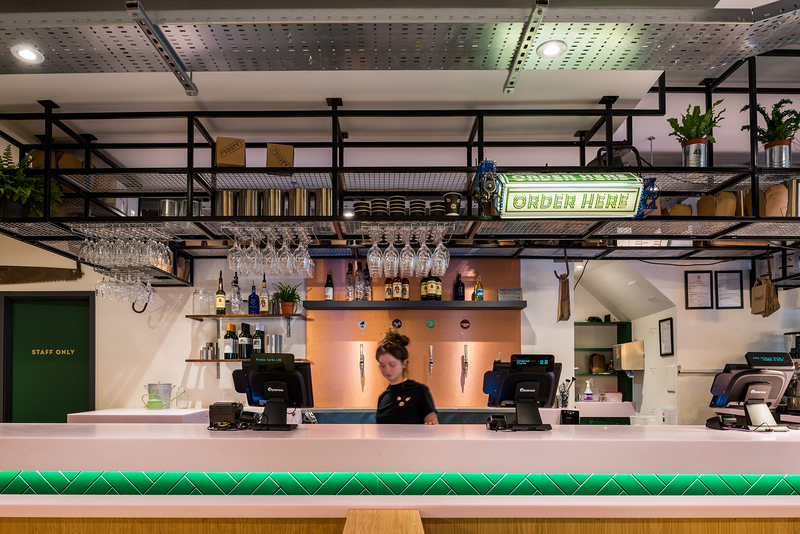 The interior concept mixes town and country via old and new industrial elements, butcher’s shop tiling (some dating from the Twenties, from an original pork butcher on the site), plus warm green herringbone timber and playful pink-grouted green ceramic tiling and graphic slogans. The Jolly Hog, begun by entrepreneur and ex-Harlequins rugby union player Olly Kohn, with brothers Max and Josh, offers an array of pork products with outdoor-bred meat, ethically sourced from RSPCA-assured farms. When Olly Kohn was injured playing rugby, he was given a sausage machine by his wife as a present, while he recuperated. Things were soon more than just fun. Seeing the business potential in creating a really high-quality pork product, he and his brothers teamed up with Will Collier to launch the Banger Bar, a pop-up at the Ace Hotel in Shoreditch in 2015, selling premium hot sausage snacks. 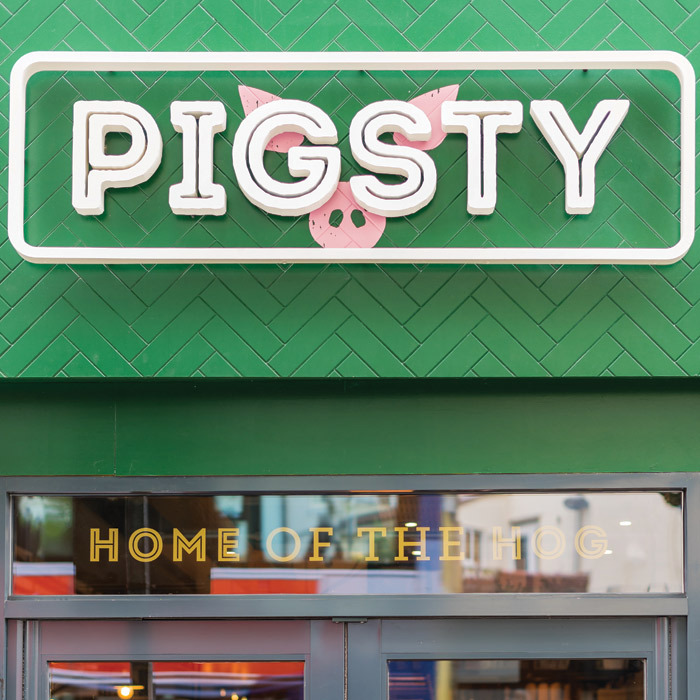 Pigsty represents the next stage in the evolution of the Jolly Hog, opening an outlet in a 24-cover converted shipping container in Bristol’s Wapping Wharf in 2016, before asking design outfit Phoenix Wharf to help with the creation of a second, larger site. Phoenix Wharf first came on board on the new project in autumn 2017, not long after the business owners secured the property, but in fact the two parties had already met – thanks to Instagram. ‘Our initial involvement started with an Instagram post from the Jolly Hog, which we picked up on, asking for design ideas for a menu stand for the original Wapping Wharf outlet – in exchange for sausages and bacon,’ said Emma Gullick, senior designer at Phoenix Wharf. ‘Tom, on our team, was one of hundreds who responded to the shout-out, but once Pigsty’s owners took a longer look at us – particularly liking our work at the Ensemble café restaurant in Wells, for example, which was shortlisted for a restaurant & bar design award – they chose us for the project. The design brief for the first permanent Pigsty site was to evolve the look and feel first expressed in the Wapping Wharf shipping container outlet, but to raise the bar by creating a more grown-up, premium feel and catering for customers who want to sit and linger. The design also reflected the location, as Gloucester Road is an up-and-coming area of Bristol, with a young and edgy feel at one end and a more traditional, pub and retail focus at the other end. When it was discovered the site had housed a pork butcher’s business, from 1900 to 1950, a further strand of inspiration was added, with trace elements of that shop and era going on to become an organic part of the new concept, including original tiling and areas of exposed concrete flooring, complete with historic marks and scuffs. Pigsty has a large, glazed shop front with five tall fold-back windows, set with a green herringbone timber surround. The logo, in white, plus the snout-and-ears brand mark sit over the door and are also used for the projecting sign, while gold lettering over the entrance introduces key brand messaging as ‘Home of the Hog’. Inside, the layout includes an open kitchen to the rear, underlining a feeling of transparency and adding theatre, with the surround to the kitchen pass in a green ceramic tile with pink grouting. To the right of the space is the bar area, while the main restaurant houses various seating zones to cater for all-comers, including booths and smaller freestanding tables. 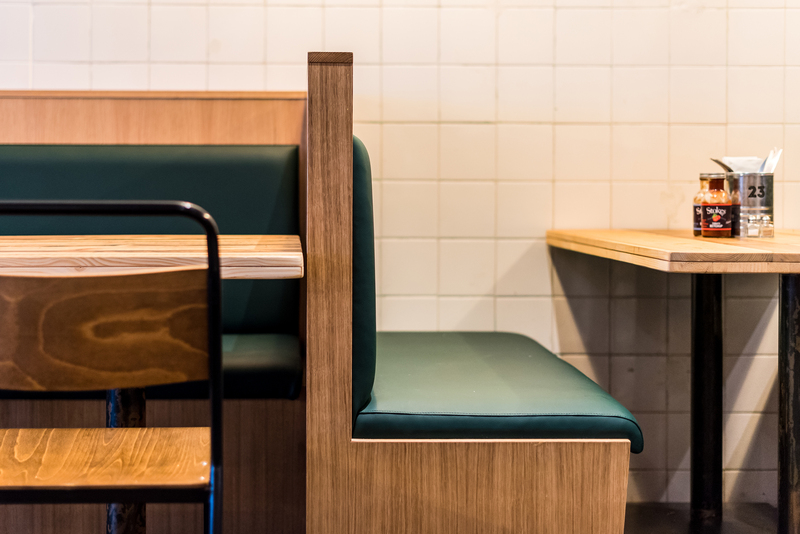 The rear seating area by the kitchen features a number of taller, group-dining tables, as well as bar-height stool seating. The new bar-front is in a green herringbone-pattered timber, with pink used again for the bar top in a pink flecked, textured Corian, LED-lit below the bar top overhang. A copper finish has been used on bar-back wall cladding, while a black iron gantry over the bar is another nod to an industrial look and feel. In addition to the exposed areas of concrete flooring, grey timber has been used in some sections. Tables are bespoke and made by Simon Kohn Furniture. 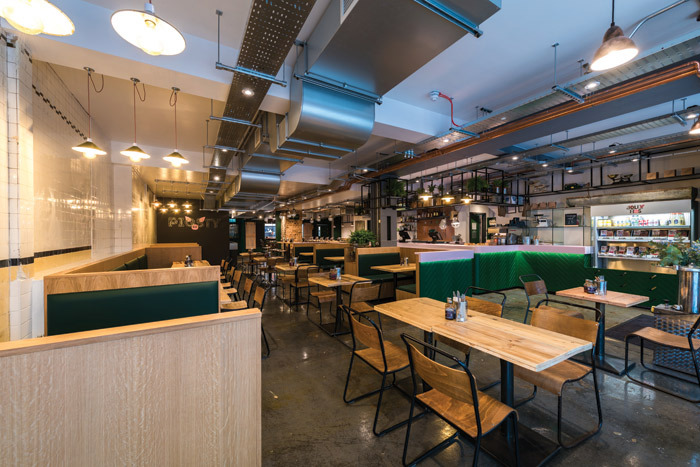 Booth seating is in natural timber with green leather seat pads, with green herringbone timber as the external surround, while an eclectic collection of freestanding chairs with metal frames and wooden seats and backs have been sourced from antique markets for a ready-worn, vintage feel.